This months Look Fantastic Beauty Box is definitely my favourite so far, I said last month I wish there were more beauty/makeup products and low and behold there are! Three full sized products too this month, including a new release from Benefit! The #LFSummerLovin is the perfect companion now it looks like summer might actually be making an appearance! 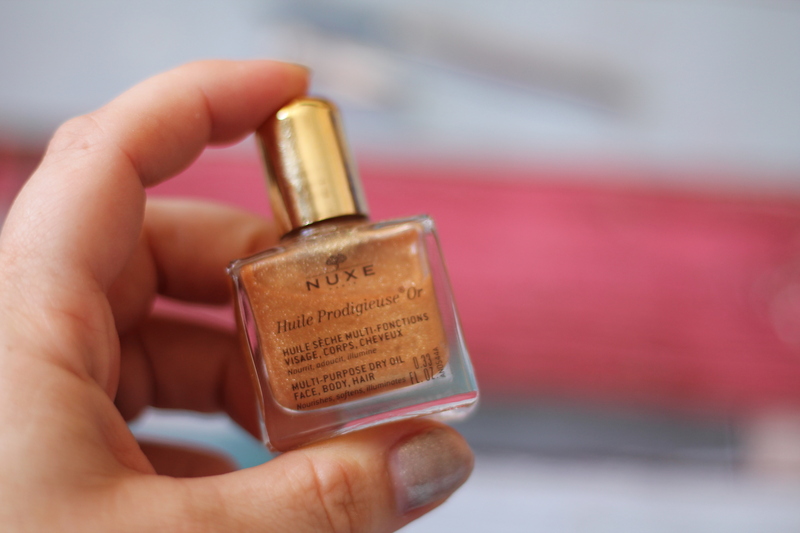 Nuxe Huile Prodigieuse Or – a shimmery multi use oil, although personally I wouldn’t use it in my hair for fear of looking like me wearing gold hair mascara circa 1998. It mixes really nicely with the cheek/lip stain in the box to make a lovely lip lightly shimmery lip tint though which I found out by accident after swatching them both in the same place! This Works In Transit mask/primer – A lovely non-drying base that I’ve used under foundation the only time I’ve bothered to wear it in the last few weeks! My face looked fresher and brighter and I could get away without using concealer! Benefit Cosmetics Goof Proof Brown Pencil – I wanted to love this, but it just doesn’t give me the defined brow I can get with some dark brown eyeshadow and a slanted brush. Saying that my normal brows can look a bit extreme for a morning at playgroup and this gives a much less harsh look. I think it’s partly because the colour I got isn’t as dark as I am used to. It took me a couple of attempts to get the hang of using the oddly shaped twist up pencil but I am really impressed at a full size product! Kebelo Silk anti frizz serum – The first hair product, and I have so much hair that I tend to use these sample sizes up in go on it so can’t really formulate an opinion, but lets just say my fine flyaway new hair after baby regrowth wasn’t tamed and still framed my face, but I don’t think anything would be able to tame that lets be fair! Bellapierre lip & cheek stain – I love a multi use product and although I don’t really do lip colour as I said earlier I accidentally used this with the Nuxe oil and it looked really summery, subtle but shimmery. As a cheek stain it is perfect, easily blended in and easily buildable too. Mi Ti hair ties – I rarely have my hair down these days so hair bands were definitely welcome in this box! I’d not used these before and they’re meant to leave your hair kink free. They do! They hold really well and are more or less snag free too. I’m not sure if there are other colours than white in the boxes this month but they are available in other colours on the Look Fantastic website, and this is a full size pack too! I was sent a box for the purpose of this review. I need to sort my makeup out for this summer.